Yep, it’s the Facebook 25 random things meme, I’ve been tagged often enough now that I figure it’s time to do it. I have one ear that sticks out further from my head than the other. When I was in my late teens a doctor suggested I might want to have surgery to “fix” it. I didn’t think it was broken, after all I can hear just fine with it thank you. 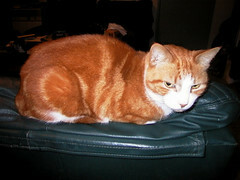 When I was pregnant with David I really regretted calling the cat James. We may well have used the name for a child had it not been already taken. I usually read books so quickly that, sometimes within days, I can barely recall any details of the plot. Re-reading is thus almost as much fun as the first time through. I broke my right arm twice when I was in 1st grade. The first time was at school, I tripped over on the oval when being chased by a boy. He was chasing me because I had kissed him in class. I once owned a mouse named Mrs Frisby. 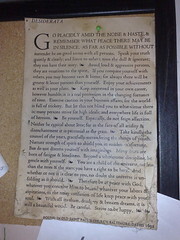 I still have the photocopied Desiderata that was given to me by my 5th grade teacher in December 1981. It’s on the corkboard above my kitchen bench. When I was a kid I did ballet. I quit at age 12 when my teacher suggested it was time to start doing pointes classes. I have never had so much as a single puff of a cigarette. I am ridiculously fond of my ankles. If I don’t write things in my diary, or at least somewhere, I forget. To wit, note to self: I have an appointment with David’s teacher after school tomorrow. I am fascinated by the origins of words and the development of languages. I just googled “to wit” because I can’t remember the last time I saw it written down and found this. I can drink strong coffee as I read in bed, turn the light out and be asleep within moments and not wake till the alarm goes off in the morning (or the dog gets up and comes and wags her tail at me). Clara has the loudest wag I have ever encountered. I have never plucked or otherwise altered my eyebrows. My house is very untidy. I am seriously considering employing a cleaner because then we would be forced to clean up the house for the cleaner. I have swum with stingrays. Last week David told me he thought my speech at Presentation Night last year was really good. I am inordinately pleased that he is apparently proud of me and not embarrassed that his mum was up there on stage. I do not have my ears pierced. When I was little I used to collect snails and keep them as pets. I loved watching their eye stalks unfolding and waving around. Snails are cool. I have been working on the same cross stitch bookmark for more than 2 years. It has been in my handbag for nearly all that time. I will finish it one day. My wedding dress is bundled up in a plastic supermarket bag on top of a bookshelf in my bedroom. I have never been able to feel remotely sentimental about it. I’m not even sure why I’ve kept it. I can not remember my kindergarten teacher’s name. Be careful about those stingrays Mim… you know that’s how Steve Irwin got it in the end. Bet they could pierce your ears for ya though. PS: Missed you while I was in Dallas, but I did try to keep up with Mim’s Muddle on my BlackBerry while I was there. I ADORE your fondness for your Ankles, made me smile. Unlike you I really NEED to pluck my eyebrows, for both vanity and safety sake. I’m sure the buggers would grow over my eyeballs if I let them!!! I guess I should do this meme too eh? The first thing my sisters said to me when they knew I had a date with Rod was, “Please let us pluck your eye brows for you”. Strangely, my unplucked state did not put him off. That’s SNAP on 3, 10, 11, 12, 17, 24 and 25, except that with respect to 24, it’s in a very old suitcase. I will be checking out your ears next we meet. Meanwhile you made me meme! Thanks. We really should hang out together – on the side of the house WITHOUT the Golden Orb. 22 C. is perfect for me, too. If it gets above 25, I start to get cranky. I broke the same THUMB three weeks apart when i was 14. it’s a miracle I can use it – and it works perfectly, just a bit malformed. I’m re-reading Harry Potter Book 6 for the 4th time. I had started re-reading HP Book 7 for the 3rd time a couple of days ago, but decided I needed to go back to Book 6 for a complete refresher. Next week, I’ll go back to Book 7. I’m not doing the 25. I just smiled so much as I read your list that I wanted to let you know you’ve got like-minded friends. Thanks for sharing Mim. Thoroughly enjoyed learning more about you. Alix – the stingrays are awesome, they come right up to you as you stand in the shallows and bump against your ankles hoping you’ll feed them. It’s because there’s a boat ramp near by and the fishermen clean their catch on the beach and feed the scraps to the rays. Em – yes, you should meme, and I see you did! Splock – you just used meme as a verb didn’t you. You evil, evil man. Sophie – there is no side of the house that can be guaranteed orb-weaver free! But I’ll hang out with you anytime you like 🙂 When I was in my late teens I coveted a copy of the complete Oxford English Dictionary. I had every intention of buying it one day. Of course I could buy it now, it’s available on CD-ROM, but I should probably just subscribe online instead. Cathy – thank you 🙂 Are you going to meme too? Hah! That’s great. I also read books quickly and I rarely have any trouble sleeping. I can’t believe that you swam with the stingrays! I would never have thought that about you and you are so calm about it. Very cool! at lest- a blog friend close to home !!! Hi Lisa 🙂 Thanks for visiting, I look forward to getting to know you!